John Graham Mellor (21 August 1952 – 22 December 2002), known by his stage name Joe Strummer, was a British musician, singer, actor and songwriter who was the co-founder, lyricist, rhythm guitarist and lead vocalist of the Clash, a punk rock band that was formed in 1976 as part of the original wave of British punk. Their music also incorporated elements of reggae, ska, dub, funk, rap, and rockabilly. The Clash were one of the most prominent of the emerging bands in the UK punk rock scene, with their second album, Give 'Em Enough Rope (1978) reaching number 2 on the UK charts. Soon after, they began achieving success in the US, starting with London Calling (1979), and peaking with 1982's Combat Rock, reaching number 7 on the US charts and being certified 2× platinum there. The Clash's politicised lyrics, musical experimentation, and rebellious attitude had a far-reaching influence on rock, and alternative rock in particular. His musical experience included his membership of the 101ers, Latino Rockabilly War, the Mescaleros and the Pogues, in addition to his own solo music career. Strummer's work as a musician allowed him to explore other interests, which included acting, creating film scores for television and movies, songwriting, radio broadcasting, and a position as a radio host. Strummer is one of the iconic figures of the British punk movement. Strummer and the Clash were inducted into the Rock and Roll Hall of Fame in January 2003. 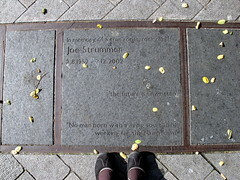 In his remembrance, Strummer's friends and family established the Strummerville Foundation for the promotion of new music.